Members of the CSU Community - referring to Instructional Staff, Non-Instructional Staff and Students - shall have access to information in the custody and safekeeping of the university, in accordance with the provisions of this Manual and with the Data Privacy Protection memorandum of the University (OP-5004-MEM0-2017-06-102) dated June 27, 2017. 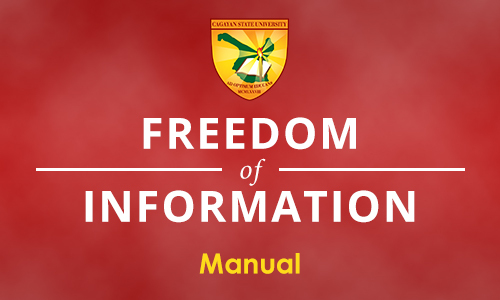 All provisions of this Manual should be construed and harmonized with the aforementioned Memorandum on Data Privacy Protection at the Cagayan State University. No derogation from the said Memorandum shall be construed. All documents, records and files characterized CIS confidential by existing law and jurisprudence. All documents, records and files that, when disclosed, would pose a clear and present danger to the life, liberty or property of employees or students of the university. All confidential memoranda, letters and transmittals to the President, to the Vice-President or to the Campus Executive Officers on matters of advise, counsel or consultation. The layout of campuses particularly	the location of	safes, treasuries, storage rooms of expensive equipment and supplies, including the supply room. Personal communication received by students, members of the faculty, personnel and administrators in their personal capacities. The access codes, pin numbers, code numbers of university deposits and accounts in whatever institution. In accordance with Section 8 of the presidential Executive Order, the Vice-President for Administrative and Financial Affairs shall be the officer responsible for receiving requests for information and documents. The Vice-President for Administration and Financial Affairs may designate this function in writing, and with the approval or the University President, to the University Legal Counsel or to its Resident Ombudsman. Routine requests for certification of grades, transcripts of records, diplomas or statements of accounts by the persons concerned and interested shall be made and complied with according to established university procedure. All other documents requested as rout1ne matters in accordance with regular university operations and personnel affairs shall likewise be processed and dealt with in accordance with existing university procedure. When the request for information or data is in connection with academic research such as the writing of a thesis, dissertation or the conduct of research, the institution or graduate school head must certify to the legitimate status of the researcher, and the request should be directed to the Vice-President for Administration and Finance who shall take action on the request. Except in respect to the cases falling under the next preceding section, all requests for documents of whatever nature and whatever form shall be addressed to the officer named in Section 4 of this Manual. When such request is filed with any other office or any campus of the university, the request shall be forwarded to the Vice-President for Administration and Finance with the endorsement of the Campus Executive Officer. The party requesting for information or for the release of documents must be informed of the endorsement by the endorsing official in writing, Indicating the day and time of endorsement. Any person who requests access to information shall submit a written request to the Vice-President for Administration and Finance. If not property addressed, it shall be endorsed to the latter university official by the Campus Executive Officer concerned. The request shall state the name and contact information of the requesting party, provide valid proof of his Identification or authorization, specifically in the form of the Community Tax Certificate or the Taxpayer Identification Number. It shall describe the Information request or specifically state the document requested. No general request covering a number of documents shall be entertained. Every request should pertain to one specific document only. The request should also state the reason for the request and the purpose to which the information or document shall be put to use. University officials and personnel who are approached for assistance in this respect are duty-bound to render assistance to the requesting person by directing and aiding in the proper preparation of the request letter, or by referring the requesting party to any qualified or competent person who may so render assistance. The request shall be deemed made only from the time of its receipt by the Vice-President for Administration and Finance, provided that: the request must be acted on within fifteen (15) days in accordance with Republic Act No. 6713, and provided further that: when the request is filed before any other office, the same office must, within seventy-two (72) hours, not including Saturdays, Sundays and holidays, forward the same to the Vice-President for Administration and Finance. A favorable response must include a certified true copy of the document requested, if any is requested. In no case shall originals be issued. In case the request is denied, the denial must state the reason for the adverse action. It is also an option for the Vice-President for Administration and Finance to refer the request to higher offices, includ1ng the Office of the University President or to the Board of Regents. When the request has for its object a document or information pertaining to any employee or student of the university requested by one who is neither a relative of nor authorized by such employee or student, such employee or student must first be informed of the request for the information or the document and the identity of the party requesting for such document or information. However, even if the such an employee or student objects to the release of the information or the document, if nothing in law, jurisprudence, or the Data Privacy Protection memorandum of the University President or this manual prevents the release or issuance of such Information or document, the same shall be provided or issued. If the employee or student concerned furnishes proof to the Vice-President for Administration and Finance that a petition for injunction has been filed in court that includes a prayer both for a Temporary Restraining Order or a Writ of Preliminary Injunction, the Vice-President for Administration and Finance shall await the disposition of the court on the prayer for a Temporary Restraining Order before ordering the release of the information or the document. This Manual shall be supplemented or modified as necessary by subsequent Memoranda issued by the University President.